Well, this time it's MY turn for a paid product review. Courtesy of BlogHer and Games.com, I'm earning a cool $50 US to play some games. Seriously - PLAY - SOME - GAMES! Does blogging GET any better than this? But with regards to actually PLAYING the games... psssttt... here's the thing. I don't actually PLAY online games, I've NEVER played online games. I've played games on my computer, I've played games on game boards, but I've never ACTUALLY played a game online - until tonight. And the weird thing is? It was kinda fun... in that "holy s*** I'm a dork" kind of way. The truth though, is while they were fun, there was one I liked a WHOLE lot better than the others. But to make sure I didn't jump to any SNAP conclusions, I tried out Hearts, Bingo, AND Solitaire - you know, for the fair assessment kinda thing. Not surprisingly (for me), I liked Solitaire the best, but meh, it was still good to try the others so I at least have some CLUE what some of my team is probably doing when they're NOT doing my project work! So, first and foremost, the thing I think matters the ABSOLUTE most, is with Games.com, I can play as a "Guest". There is no signup, there is no form, and there is no submission of email address and other information I find I have to give out WAY too often online to do anything. That act in itself - the act of NOT signing up - sold me. Admittedly I'm a simple sell when the product's easy, but honestly, making things easy DOESN'T seem to be something a lot of companies are good at, and when it comes to something I'm going to use to distract myself with, well, it BETTER be easy. As for the actual GAMES, I started off with Hearts. I really don't know WHY I started off with Hearts, when truthfully I've never even played the game in real life, but I did. And while the game was fairly easy in that it was just a matter of CLICKING and following along, for me there was one interface flaw that really bugged me - I couldn't just click my cards like I did later in Solitaire, I instead had to click the cards and THEN click the additional "Play Card" button. And while to most that's probably not a big deal, I work in a world where interface is KEY, and something about that button got under my skin. Cuz yea, I'm just THAT finnicky. Next, I moved onto Bingo. Now THIS game, that's more my speed - well, once it got going. So with Bingo, it's all about TIMING. If you come into the game when another game JUST started, you have to wait 70 seconds before the next game [that you can join] begins. Now 70 seconds isn't that long in real life - I fully admit that - but online, it seemed like an ETERNITY. However, once the game got going and I came back from surfing Perez's latest dirt, the game was awesome. The numbers were called really quickly (but not so fast you can't keep up), the latest number called is displayed in RED so you have an indication of where they're at, and all the previous numbers remain posted for you to see. And if you click the WRONG number, while it won't tell you you DID it, it will at least let you de-select it again. 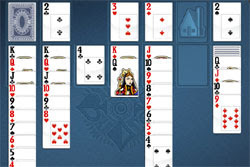 And last but not least, I played Solitaire - my favorite card game in real life, and now my favorite card game online. The thing with Solitaire is that it's EASY. Whether it's online or in real life, it's just plain simple, and when I've had a really long day at work, THIS is the game I'd play to unwind. There's not much thought to it, there's no math (I HATE MATH), and there's not really any horrible punishment for screwing up - you merely just start again. And with the Games.com version, it's just a click for a card or a click for a re-deal - no extra buttons! And it even FLIPS your other cards FOR you! So THIS game, THIS would be my online game of choice. Two thumbs WAY up for Solitaire. Two thumbs up for Bingo. And one thumb up and one thumb down for Hearts. But the Games.com site as a whole - that gets two thumbs up from the "guest", cuz I LOVE being a guest. For more reviews of Games.com, check out the BlogHer Roundup. Not having to submit personal information is good. I've never been a fan of games. Well, BINGO is fun, but I like the church hall atmosphere and the card stampy thing.